I've made this a few times now, still tweaking it a little bit here and there... it's a Greek inspired pork loin, served over a bed of spinach with some feta cheese. 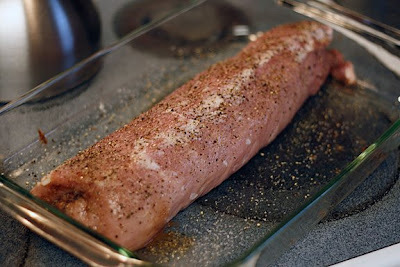 The pork loin is rolled around a Greek salsa of sorts: kalamata olives, tomato, onion and spices. 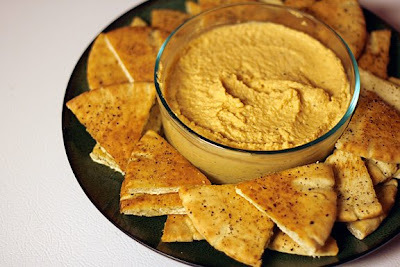 Served with some hummus and a pile of baked pita triangles ahead of time! 2. Blend, then set aside for later. 1. Slice pork lengthwise, doing the best you can to create a flat piece of even thickness. You're going to be rolling this up in a bit. 2. 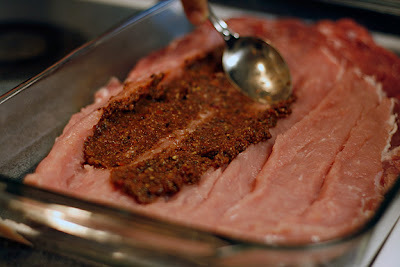 Spread the greek salsa you made earlier all over the unrolled pork. 3. 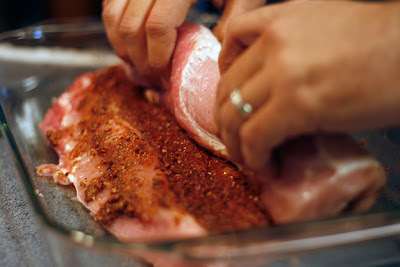 Roll the pork back up on itself. I do all this right in the baking dish. Lay it back down in the dish. 4. Some salt and fresh ground pepper across the top, then the juice of 1 lemon squirted all over. 6. Let the meat rest for about 5-10 minutes, then slice into 1/2 inch pieces. 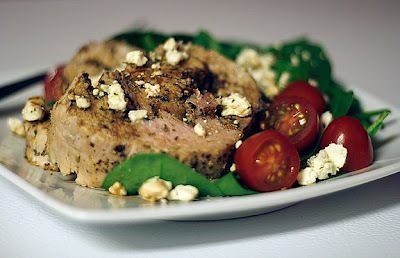 Serve over a healthy handful of spinach, a few grape tomatoes on the side, some feta cheese across the top, and then a spoonful or two of the liquid from the pan back on top of the pork slices. Additionally, I drizzled some good balsamic vinegar over the entire plate. Bobby cooked this for us (minus the hummus), and it was very tasty! If this recipe still needs tweaking I think you ought to make it for your parents. Soon! By the way, is drool bad for my keyboard?! Just wondering. Looks yummy!